Iranian truck drivers have begun their second round of a nationwide strike on 27th September to protest rising cost, low paychecks and threatened spare parts prices. As this strike entered its second week, Iran’s Attorney-General Mohammad Jafar Montazeri threatens the strikers to execution. Montazeri said: “According to the information we have, in some routes, some of the cities, there are elements who are provoking some of the truckers, or possibly blocking them and creating problems for them. They are subject to the rules and regulations of banditry and the punishment of the bandits according to the law is very severe, sometimes resulting in the death penalty. “(News Network TV News – September 29). 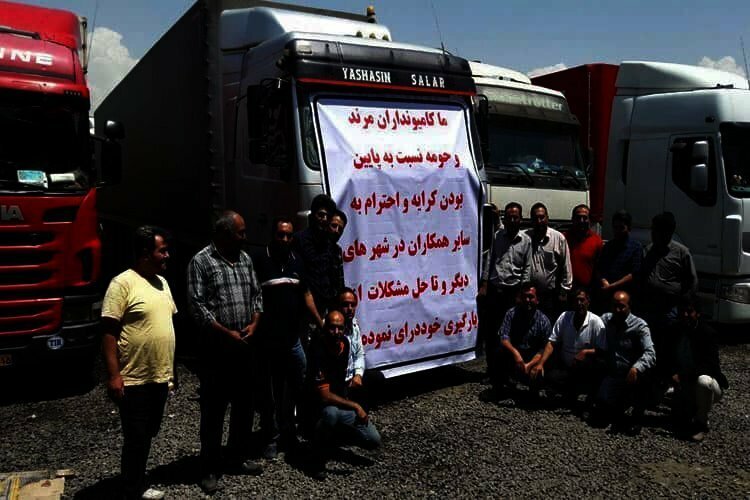 On the other hand, the Fars Province Transportation Director-General had called the strike of truck drivers as rumors and said: “It’s been a few days that rumors about truck drivers’ strike have been circulating in the media and cyberspace. This misuse of the opponents from the needs of the truck drivers to create a crisis in the country is clear for every Iranian (FARS, Islamic Revolutionary Guard Corps news agency, September 27). Video clips posted online by striking Iranian truck drivers showed the strike has spread to more than 200 Iran’s cities and provinces. However, truckers have rejected the officials’ promises as lip service and say they will continue the strike until all of their demands are met.